Wow! What a day this has been and it's not even 10 AM. I get home from work, and barely drink a cup of coffee, and the phone rings. My son will be arriving on the 9:12 AM train. So off Tootsie and I go to the train station. Lordy, he looks so good to me that boy of mine. He's going to be a grampa this Tuesday. Is he proud? Or what? Before all this unexpected excitement, I was giggling to beat the band. 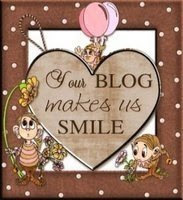 Sometime back, Miss Rachelle at http://dood-elle.blogspot.com/ had the cutest darn little chicken doodle on her blog. I asked if I could have him, and today she posted a whole set of "Chuck the chicken who thinks he's a duck." She has the neatest stuff on her blog. give yourself a treat and visit her today. Is this not the cutest darn little chicken you ever did see? And he fishes, no less!!!!! This lady is very talented. She turns doodling into an art. One of these days, I'm going to be making a chicken kit, and you know Chuckie Baby is going to be in it. 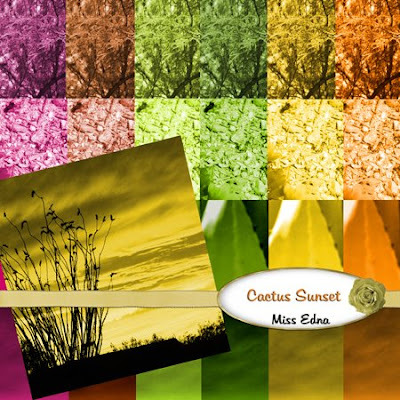 Today, I have another set of "Cactus Sunset" papers for you. Tootsie and I are going to settle down and visit with her Uncle Jr (that's my son - he's a nervous wreck about the new baby that's coming, and he's not even the one who's having it!). Boy, I think my PC is about to burst. I hate to part with things, so that means that there's an awful lot of junk on my PC. I would put things onto CD's and DVD's (a lot of it I do) but then I think what a nuisance to haveto keep referring to the CD's and DVD's. Even when I do archive stuff onto discs, I sort of can't bear to remove the stuff from my PC. I really do need some new habits. Like, empty out my PC. 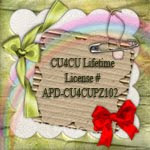 Learn to use reference CD's & DVD's more often, become much neater and more organized. Oh well, the new year isn't too far off (Nov 1 for me), and I can make some new resolutions and REALLY TRY to keep them. 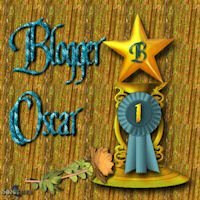 Blogger seems to be having a problem today. They're telling me (at the bottom of my screen) that they can't save my post today. Wait a minute folks, they just changed their minds. Now they're going to save it. Working with Blogger is really a bit tricky. You can't always put your text and pictures where you want them. And, sometimes they re-arrange your paragraphs, or worse yet, erase what you're posting. Just have to be patient with them. Wow, do you see what I see? In three days, it will be September!! Am I missing something here, or has this past year just taken a jet and flown right on by me? I look around me, and the leaves on some of the trees are already beginning to change their colors. I wonder if Wisconsin has pretty Fall colors too. That's where I'm off to in a couple of weeks. This is going to be such fun, I can hardly wait. I don't need to tell you that Tootsie isn't going to be thrilled. This will be the first time I've left her with someone and gone away for a while. 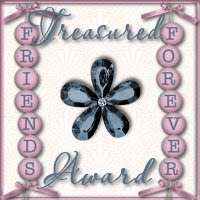 Because it's Friday night, and I'm in a fantastic mood, I'm going to post two freebies for you. Tomorrow's freebie will be a new QP for one of Snow Raven's new kits. Wait till you see her new kits. I think they're in the store at Scraphead now, or they will be for the weekend. 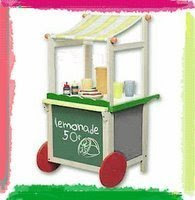 And on sale too!! 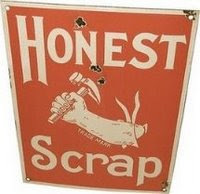 http://www.scraphead.com/ We will resume posting "Cactus Sunset" parts on Sunday. Tootsie and I are off now. Going to visit with Moo for a bit, then off to bed and some TV. Today is such a busy day. Whew!! This morning, Tootsie had her appointment. She looks so darn pretty!! Then of course, we had to go into the retail part of the store (Petco) and shop for some new clothes. And what did we find?? A Patriots shirt for Tootsie. She already has a Red Sox shirt, so now she's all set. Next, we went to get our new sticker and inspection so that we can drive our car for another year. After that, we had to fill up the gas tank. Then we're off to find our favorite mechanic to see if he can fit in an oil change. Hopefully this will quiet the ping ping ping in the motor. He can see us this afternoon, so we'll go back to see him shortly. 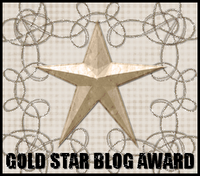 You have to link your tagger, and list these rules on your blog. 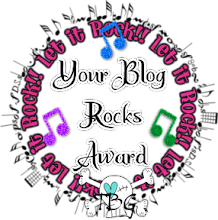 You have to tell seven things about yourself, and then you have to tag seven other folks, list their blog address, and leave messages for them on their blogs. Little know facts about me. 1 - I'm a cheap date, cheeseburger and spring water and I'm good to go. 2 - I don't like going to movies. I'd rather watch in the comfort of my own living room. 3 - I am sort of dyslexic. It takes me a while to write or type because the letters don't go where I put them and I have to go back and rearrange them. This is amazing because I am always reading books. 4 - In my hey day, I used to be a Sunday School teacher. Imagine that!! 5 - Some years back, I had a ceramics store and we gave lessons. We also taught classes at several local schools, and at the Senior Citizens Complex. I always wanted to be a teacher. 6 - As a child, I would collect snakes and bring them home as pets much to my mother's horror. Now, you can't pay me to be near or touch a bug, snake or anything like it. 7 - In a few weeks, I'm going to a great grandmother again (this will make four). These are the ladies that I am going to tag. There are only five on my list (because I've done this before), and they are gals I would like to learn more about. 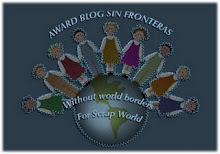 Nani at http://chroniclesofnani.blogspot.com/ Have a cup of coffee, and enjoy her posting. 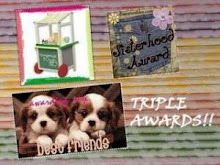 Shannon at http://ladyshannonmemoriesmadeeasy.blogspot.com/ also check her other page at http://darkladyshannon.blogspot.com/ She makes great freebies and her other blog is terrific. 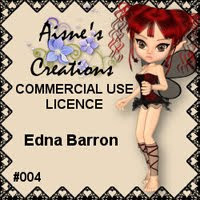 Jeanie at http://scrapdoctor.blogspot.com/ She mades the most wonderful freebies. Jen at http://www.pixelsandicecream.com/ Another great place for terrific freebies. I'm back from the garage and my car got a nice oil change. This should keep her happy for a while I hope. Please please, pretty please? Don't want to need a new car right now. My car is ten years old, but she only has 86,000 + a few miles on her. She rides nice, and I'd like to keep her a while longer. I have almost finished wrapping up, zipping up, and shooting off into cyber space for links, "Cactus Sunset." It's about 300 MB, so it will take a couple of weeks to give it all out in downloadable sizes. For being so patient with me, tonight I will post the papers preview and the first set of papers. I do hope you enjoy this one, because I've been having a grand time making it and putting it all together. Tis very late, so I won't be posting much of anything tonight. I spent a good part of today trying to sort out my trip itinerary and get my ticketing done. I will be back tomorrow with something nice for you for being so understanding. First, let me say my apologies, but I will have to take care of the tagging tomorrow. Today was a very busy day, a lot of it spent outside helping clean out the shed. Three and a half hours of it went to making previews for "Cactus Sunset" elements. Can you believe how long it takes to package up pieces of a kit? How do others do it? First I figure out how large the file is, then how many folders do I need, then I make the previews. This is where I spend most of my time. 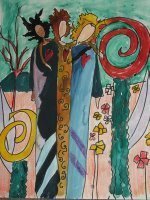 Maybe because I set each piece on the background, check for blending and shadows etc, move and rotate for best placement, tag and save along with a smaller version for showing on the blog. If there's an easier way to do this, please someone tell me. Tonight I'll share a new layout with you. I used a very pretty kit by Helen Ohrenhofer (GDS), called "Lavender Fields Weekend Getaway." The kit was a bonus for participating in her challenges at GDS. Subject is what I did this summer for fun. 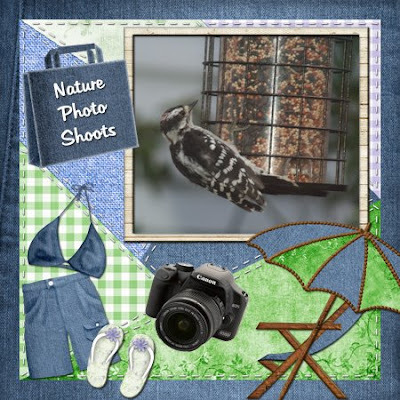 Put on shorts, grab a chair and my camera, pick a great spot, and shoot, shoot, shoot pictures of nature. Now it's time to spoil Tootsie for a while. She has been so patient while I ignore her so that I can do some work and play on the computer for a while. Got to love this little darling. Well, the big rains came today -- you could count the rain drop plops on your fingers!! The skies got dark, the sprinkle fell, and then I guess Mother Nature changed her mind and went somewhere else. After I took my nap today (worked last night), I wasn't really in the mood to do much creative work on the computer. Some days I'm just lazy and can't get started. Last night I finished up "Cactus Sunset", and yes, Nani, I think it might just be as nice as "Jazz M'Tazz." It's not packaged up yet and it's already almost 300 MB. I'll have to break it up into quite a few downloads. 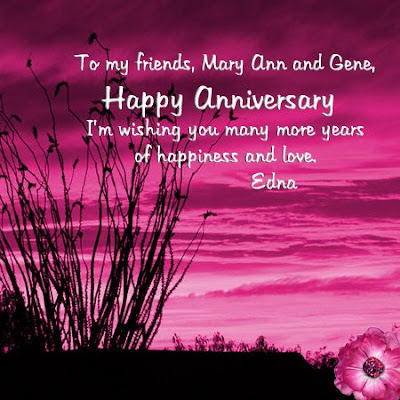 This past week my friend Mary Ann and her hubby celebrated their anniversary. 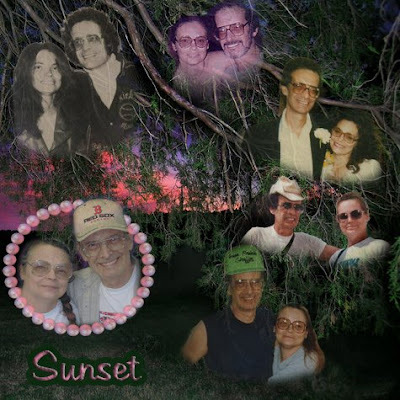 So tonight I'm going to share the card that I made for them using "Cactus Sunset." I'm looking forward to my vacation, because I'm traveling to Wisconsin to visit with them. This will be my first vacation in quite a few years. Oh Lordy, Lordy, am I ever ready for this vacation!!! 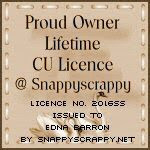 I was tagged again today by Noreen at Cajun Designz. 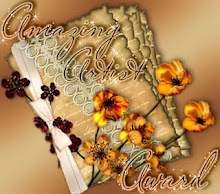 http://cajundesignscrapz.blogspot.com God Bless her beautiful soul. (I really mean that in nicest way possible. She's a lovely, talented and generous person.) I'll have to think of some more goodies to tell about myself. Tomorrow, I'll get to that, and hopefully tag someone else. Tootsie and I are going to settle in now and watch some TV. Hopefully there'll be something good on. It's halfway into the afternoon, and I haven't had my nap yet. I worked last night, and then again tonight, so I really do have to catch a few winks. There were some really lovely comments for "Jazz M'Tazz." I am so glad that a lot of you like this kit, as I had a grand time putting it all together. Thank you for all the wonderful comments, they make me feel good about what I do. At the moment, I'm working on a future kit, "Cactus Sunset." Sound interesting? The colors are beautiful. That's all I can tell you about that, it's pretty, but not quite finished. Here is your download link for Part Six of "Jazz M'Tazz"
We've been so lucky with the weather these past few days. It's been absolutely gorgeous. Maybe I'll poke around out in the yard today, clean out another box from the shed. Moo thinks maybe his new TV is too big for his room. So I guess we'll take it back, and get a smaller one. I say go for the gusto and stick with the bigger screen. Most of us older folk appreciate seeing things in the large format. The eyes don't have to work so hard trying to see things clearly. 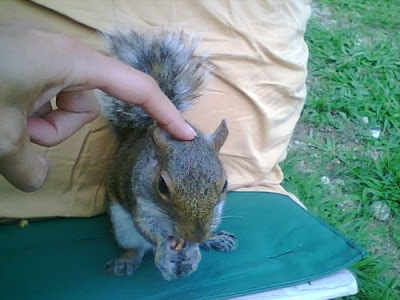 My sister-in-law Edie has a friend who has befriended a little squirrel in her backyard. He comes right up to her and eats out of her hand. 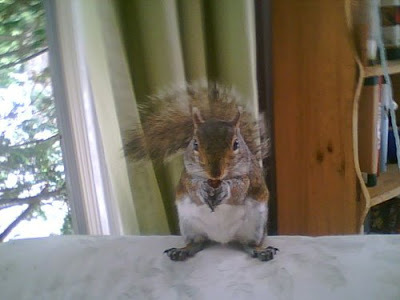 She leaves a window open, and Rocky (that's what this little fellow has been named) comes right in and makes himself comfortable, relaxing and eating nuts and goodies. Here are two pictures she sent me to share with you. I'm still here. I have a nasty headache, but I'm not quite Rocky Raccoon today. However, I don't want to speak too soon. The beginnings of a couple of black eyes has just appeared in my mirror. 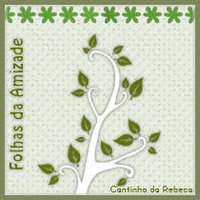 Tonight I'll share the layout that Edie and I made yesterday for a challenge at GDS. The template was supplied by Andrea Gold. 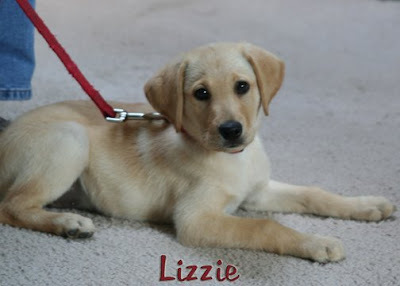 Edie hasn't seen the photos yet that I put in it. 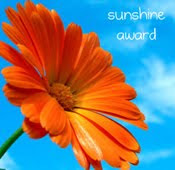 That's a surprise for her, so this is for you, Edie. 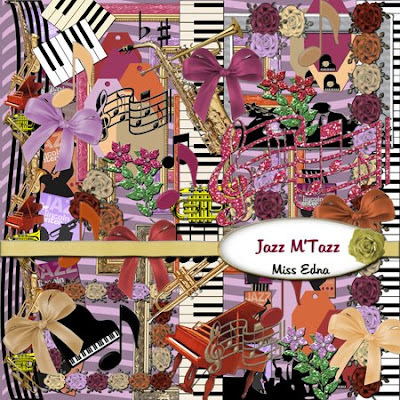 Part Five - Elements "Jazz M'Tazz"
Here is your download link for Part Five "Jazz M'Tazz"
Well, God bless me, but I fell down and landed head first on the mat outside the front door. I have a nasty bruise and a doozy of a headache. One eye is a bit blurry, and if it's not better by morning, I'll call the doctor. You know I'm going have a real beauty of a black eye soon. Otherwise, I had a lovely day. My sister-in-law, Edie, came to visit. We sat at the computer and played around in Photoshop, working on a template challenge. It came out really nice. As soon as I find photos to put on it, I'll post it. I'm going to post Part Four of "Jazz M'Tazz" for you. It's the rest of the background papers. Oh, wow, I have music playing on my PC while I'm typing, and I love the song that just came on. It's "Kiss You All Over" by Exile. Talk about a great song for dirty dancing. Yeah, I used to do that too when I was younger and had a cute figure. Didn't we all?? Snow Raven had a challenge on her blog. You had to make a two-pager; it had to have a picture of you on the first page, and the second page had to be a character profile of yourself, who you are and what you are. Life shapes what you are, and that tells you who you are. Here are my pages. I'm off to cuddle up with Tootsie, and watch some TV. Here is your download link for Part Four of "Jass M'Tazz"
Wowee, tonight I'm just pooped out. We worked on the shed for a while, then we had company for a while. (Not really company, my daughter Dee and her little ones.) That was a lovely and well deserved break. Yesterday, I broke one of my nails, so this afternoon I had to have an appointment at the nail salon. So now my nails are pretty again, and that makes me feel much better. I'm still crabby, but a pretty crab. Tonight and tomorrow you'll get the rest of the background papers for "Jazz M'Tazz" and Friday you'll get the elements. Saturday I'll have a QP from one of Snow Raven's kits, and Sunday, I'll post the last part of JM'T. My favorite program "Project Runway" is on, so Tootsie and I will be going to watch it. Tonight the challenge is for the designers to create an outfit for a drag queen. This will be a great show. 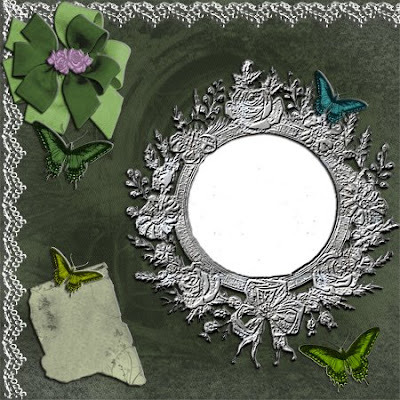 Tonight I'm going to share a layout I made for a color challenge at Scraphead. We could only use the color "Brown." I'm off to watch TV. Till tomorrow, enjoy. Preview Background Papers "Jazz M'Tazz"
Here is your download link for Part Three of "Jazz M'Tazz"
Well, the dumpster came today - takes up half my yard. Lordy, it's so hard to toss out trash! Moo keeps trying to just dump the boxes as he brings them out of the shed, but of course, I have to poke through them first. There are so many years of work and memories in those boxes. It seems just about every box has something that I find difficult to part with. This of course, gets Moo to stomping about and snorting smoke through the nose. (Did I tell you he was sort of like a little dragon?) I don't blame him in one way, but they're still my memories. We did get rid of a lot though, and we'll do more every day till the whole shed is empty. Not a bad likeness (sometimes!). Kyra, your dinner sounded pretty good too! My hubby's favorite food was yams. Tonight was my turn to cook. I made us Orange Chicken and white rice. M-m-m-m-m!! 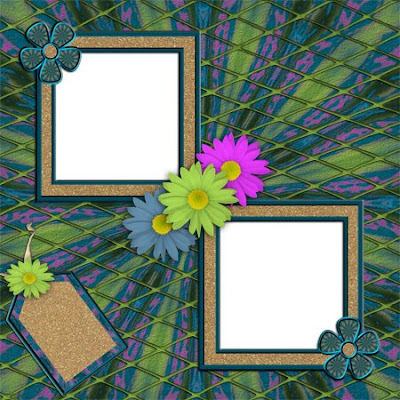 Here's a layout I just finished for a challenge on Scraphead. It was supposed to be a thank you to someone. This one's for you, Snow Raven. Tonight, I'm posting Part Two which is more of the background papers for "Jazz M'Tazz." Hope you're liking this kit. 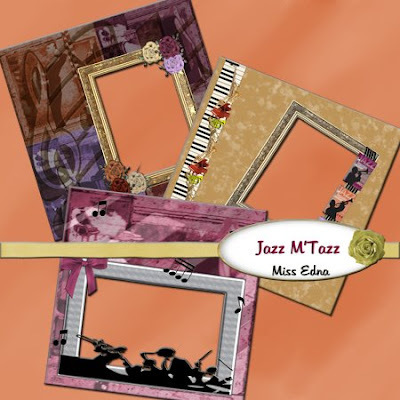 Here is your download link for Part Two of "Jazz M'Tazz"
We're on a roll!! Gorgeous weather all day again. Must be doing something right! Remember the song we all learned when we were little and went to Sunday School, "Jesus Loves Me"? On a day like this, you just know He loves us. Today, I helped Moo for a while, cleaning out the shed. We're getting a dumpster to make life easier. When we weren't looking, someone must have scattered "honey dust" all around, because next thing we knew there were tons of bees everywhere. Now you know I don't like bugs and flying critters, so that ended my cleaning session, and I went back in the house. I thought maybe I would work on a new kit or something, but I'm too tired. Can't concentrate. I think Tootsie and I will have ourselves a little nap. Can't be too tired to eat tonight. Moo is making us sausages, green peppers, onions and potatoes (all cooked together). Oh, yum, yum. Before I go, I'll post Part One of "Jazz M'Tazz" for you. The first four parts are all the background papers. I had a wonderful time making this kit, so I hope you like it. This one's for you, Edie. 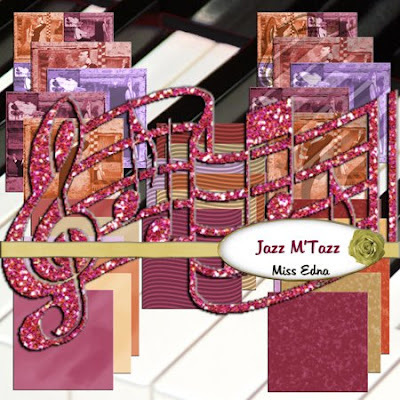 Preview of Background Papers "Jazz M'Tazz"
Here is your download link for Part One of "Jazz M'Tazz"
This Is The Weekend To Shop In MA. We've been blessed with another absolutely gorgeous day. 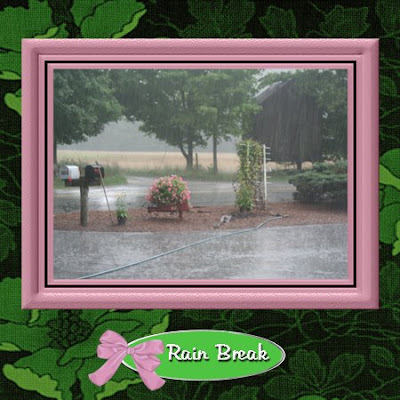 No rain today, the rain barrel is overflowing. Too bad I don't have a lawn, it would be a most beautiful green. What I do have is millions and trillions of pine needles. If you like brown, then I have a really beautiful yard. Now that gives me an idea for some kits. One color kits. I'm not sure how they would look, but methinks I just might give it a try. I'm going to try to post "Jazz M'Tazz" this week. I just need to finish packaging it up, and setting up the download links. It's a rather large kit, and had to be broken into six parts. This weekend is the "no tax" shopping weekend in Massachusetts. So, this morning when I got home from work, I stayed up to wait for the stores to open so that I could go shopping. In the past, I have never been able to take advantage of this particular weekend. This year, I was determined to do it. I started at Best Buy. (A computer and technology items store) Oh dear! groan, groan, groan....It's always a mistake to let me loose in this type of store. Even if I don't buy anything, I spend hours just looking and asking questions, and having myself a really grand time. However, today I did end up buying Moo a new 32" TV. A really nice thin one with HD. Next I went to K-Mart, and good golly Miss Molly!! They had exactly what I was looking for to give as Christmas presents for some certain people. (Can't say what or who, they might read my blog.) I am so proud of me. I am almost finished with my holiday shopping, and it's only August. 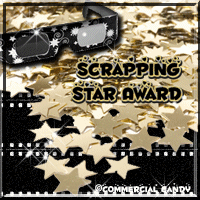 Today, I'm going to share a new layout I made for a challenge at Scraphead. It called for a snack or party recipe that kids would enjoy. Almost everybody likes fudge. 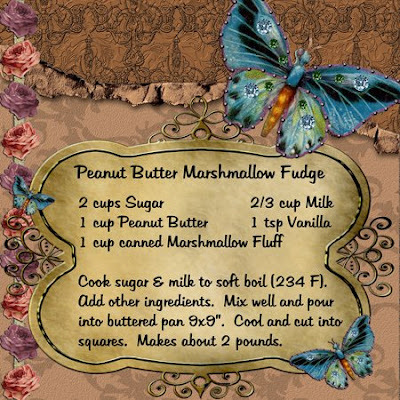 So here is my recipe for Peanut Butter Marshmallow Fudge. 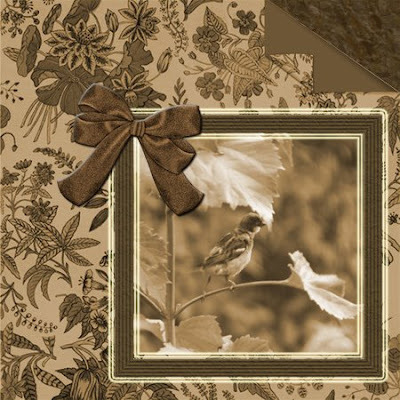 Kit used: Snow Raven's "It's A Fairytale" available at Scraphead Store. I love fudge, and it's pretty obvious that fudge loves me. If there are any recipes in particular that any of you wants, let me know and I'll see what I can do. That's it for today. Tootsie and I are going to play some ball, and then maybe take a little nap. Tonight's another working night. The sun is shining today, and we have a new bird to our feeder. This morning a little titmouse came to visit. Two days ago, we had a chickadee. What I think is wonderful is that all these different little birds can sit and feed together. We could learn a lot by watching nature. Yesterday, I forgot to tell you about what I saw when I was coming home from work. I was sitting in traffic in the school district in a small town, and a man was walking on the sidewalk and carrying a shopping bag. What caught my eye was his gorgeous outfit. He was dressed in what looked like a Carmen Miranda skirt and top, complete with jewelry, heels, and a hat. The predominant colors were pink and orange. This tickled me so, that I waved and smiled, and he waved and smiled back. Well, you know, that made my afternoon pretty nice. It takes all kinds of folks to make up this great big world, and it's nice to know that it's okay to be a little bit different from everybody else. Time to go play ball with Tootsie. Enjoy your QP. Gonna Get Me A Rowboat!! Today I feel like jumping up and down and singing "Good Golly, Miss Molly!!" Enough already!! Boy, when the rains cometh, they most certainly cometh. And cometh. And cometh. My birds are renting rowboats and little nets to the ground feeders and the chipmunks. I'm getting paranoid about bugs and ticks in my old age. Today, a few minutes after I left work, I felt something in my hair that I thought felt like a tick or a bug. I stopped the car, turned around, and went back to work to have the other girl (that I work with) look at my head and remove the nasty critter for me. She looked all over my head, but there was no bug. I must have felt my bobby pin, or maybe a fly had landed for a second or two. Either way, I felt like a real nit wit. At least we got to have a good laugh over it. I think tonight I will have that last bottle of Samuel Adams beer that Audrey bought for me last May. My brain deserves it, and so do I.
p.s. Moo had a grand time last night, except for a rather large head directly in front of him in the row of seats in front of his row. He said that for a small fee of $100.00, plus the price of tickets, you can get seats right up close to the stage. I told him that it's good for you to sit outside under the stars, and not inside the tent. No one blocks your view. This did not impress him very much. Tonight, I'm going to post the Add-on. It's a set of QP's to go with the "Let's Rock" kit. Have you noticed that lately most of my QP's are very basic? That's so that you can personalize them easier. The next kit will be called "Jazz M'Tazz." 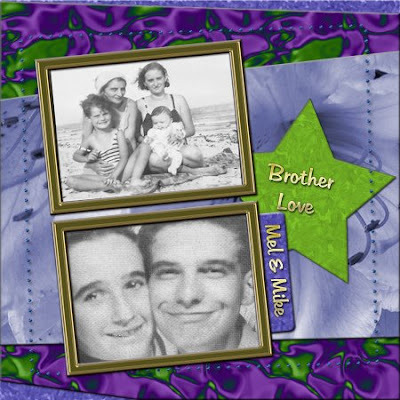 My inspiration for it was a couple of really great pictures that I saw while visiting my sister-in-law, Edie. They reminded me of taking my children to Jazz sessions on Sunday afternoons, many moons ago. At first, they balked, but then they grew to enjoy Jazz. It's good for your soul to enjoy all kinds of music. Tootsie and I have had our dinner - Home fried chicken, no less! - and now we're going to watch a bit of TV. Enjoy your freebies. 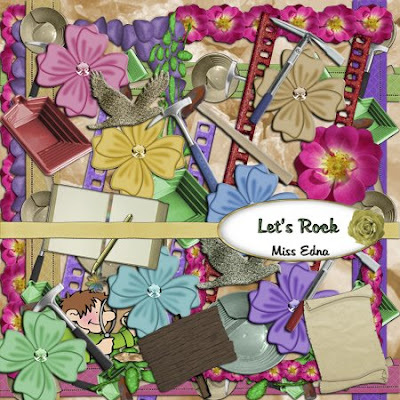 Part Four - QP's for "Let's Rock"
Here is your download for Part Four - "Let's R ock"
What a day! What a day! Last night, as soon as I finished posting here, my internet went out. For the life of me, I just could not figure out what was wrong, so Of Course! I put in an SOS call to Wayne. (my gadget techician) Later today, we also lost the phone. Someone at the cable company really screwed up BIG TIME!!! Thank goodness for Wayne, though. With quite a bit of effort and calls to the cable company, he did finally get the internet up and running and the phone too. Do you remember way back when - people getting heebie jeebies when they couldn't have their coffee or cigarette? Well now it's that way when you take away our internet and phone service. Twelve years ago, you couldn't get me to play on a computer if you paid me. Ten years ago, I bought my very own first computer. For two months, all I could do was turn it on and turn it off. Then reality sank in, and I had to try to learn how to use the foolish thing. Now I don't know what to do with myself if my internet is down. Talk about turn-about. Okay, enough chatter. I'm going to post Part Three for you. This will be the elements. Then I'm going to wait up for Moo. He and his best friend have gone to the Music Circus to see Jeff Dunham, the puppeteer. I want to hear all about his fun evening. Enjoy your freebie. Part Three - Elements "Let's Rock"
Here is your download link for Part Three "Let's Rock"
Today was busy, did some errands and a bit of laundry. God bless Moo, he vacuumed out my car. It looks somewhat neater now, even though there's still a bit of "stuff" in it. I shop the sales, and when the large packages of paper towels and bath tissue won't fit in my pantry, they have to stay in the car until I make room. Thanks for the hugs and nice words. After my disappointing adventure with the DVD recorder yesterday, I sat and watched a little TV with Tootsie, played on my PC a bit, and then tried again. This time I made it!! As long as I was on a roll, I taped three more programs. My hubby used to do this for me, so maybe that's why I'm having such a difficult time learning. Here is your download link for Part Two of "Let's Rock." I've Got The DVD Blues. I'm getting a bit frazzled today. I've been trying for the past couple of hours or so to record a movie on to a DVD from my TV (DVR). I thought I had it all done, made a call for help to get the disc finalized, and then played it back to make sure it came out right. You guessed it!! Another dud for me! So now I'm starting all over. I have till Monday night to get this right. That's when Wayne will be back next to help me. I just don't understand what it is about this particular type of equipment that I can't seem to learn. What I can do is make layouts, and I'm very proud of my newest one. 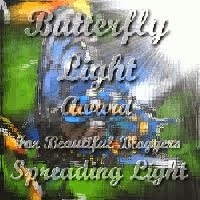 It features my youngest grandson, and a poem he wrote back in April. 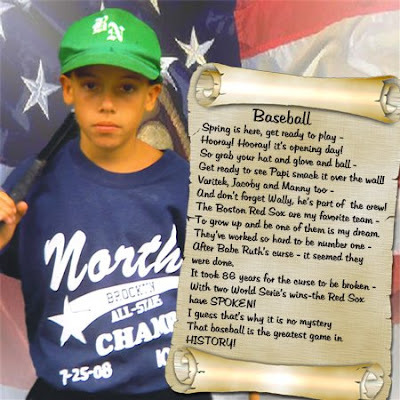 This young man is a terrific baseball player, and dreams of one day playing for the Red Sox. Boy, oh boy, I certainly hope his dreams come true. My friend Mary Ann is home from the hospital and recouperating. Here's to a speedy recovery for you, Mary Ann. 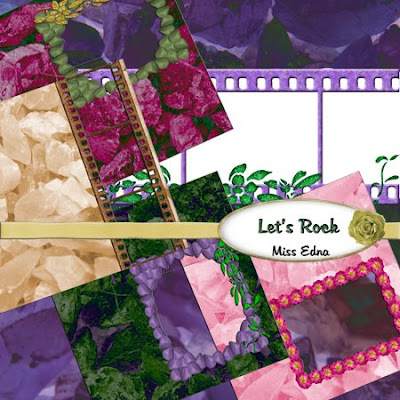 And thanks to you for the rock pictures that became the inspiration for my newest kit, "Let's Rock." There are four parts, two for background papers, one for elements, and one for a set of QP's. Today I'll post Part One. Hope you l ike it. Here is your download link for Part One "Let's Rock"
I no sooner finished posting here yesterday, than the phone rang. It was my friend Rhoda from Florida. She and her husband were already here, and better yet they were only minutes from my house and were stopping by. Lordy, it was so good to see their faces again. It's been so long. However, the news she brought was not the greatest. Her friend had already passed on. This was sad because they had been close friends since they were little girls. I've put a candle in the window for you Sylvia, to help light your way. It has rained all day here, although somewhere in the middle, the sun actually poked it's face through for a brief few minutes. You would think that the rain would discourage some of the birds from hanging onto the feeder. But no -- they clamp their little toes on to the feeder, and fill their little tummies right up. QP Set for "Blooms Galore"
Friends of mine are coming up from Florida to visit with a dear friend who is not expected to be with us for long. At the age we're at, these visits are becoming all too familiar. My good friend Kyra has this wonderful thing that she does. She lights a candle for the passing soul, to light it's journey. I think that's a wonderful idea. It's been a week since we filled up the new bird feeder, and today we had to fill it up again. There wasn't so much as a sniff left in it. I also put large square treats into the pockets on the old bird feeder. The woodpeckers love these. Today's little woodpecker was so engrossed in pecking away at the treat that he didn't even move away when he saw me in the window. Usually, if they see anything resembling a human, they fly away. One more night at work, and I have a few days off to play on my pc. This afternoon, I'll post the add-on for "Bloooms Galore." It's a set of three QP's. Hope you can use them. What a great day today. Not too hot, not too cool. Perfect. Sorry if I keep tooting about the weather, but at my age, a great day is a grand thing. 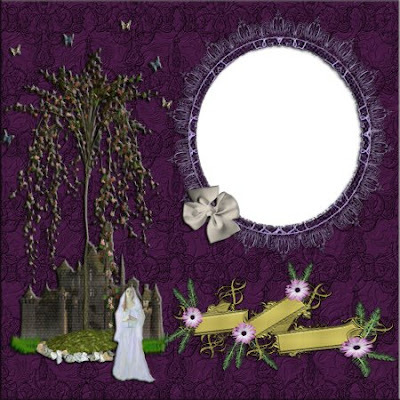 Today is Snow Raven QP day, so I'll be posting a QP freebie that I made with one of her new kits, "Gothica." 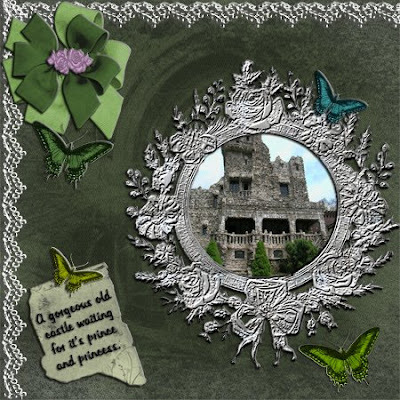 I also made a layout for it featuring a photo of a grand old castle that Miss Audrey took this past May. I would love to have a tour through this old castle. It looks so interesting. Is this not a grand old castle? It just looks lonely. 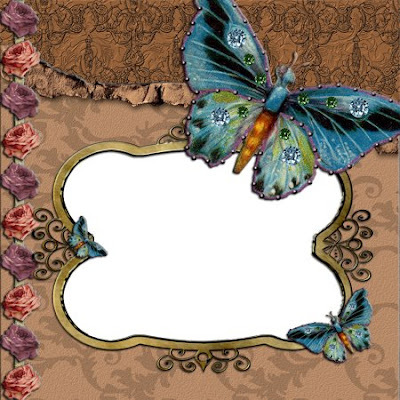 Your freebie today will be the matching quick page to this layout. 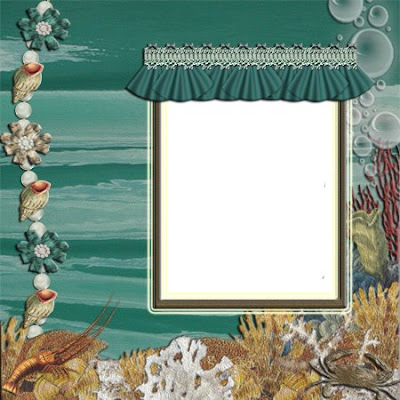 Tomorrow, I will have an add-on for the "Blooms Galore" kit. It's a set of QP's. 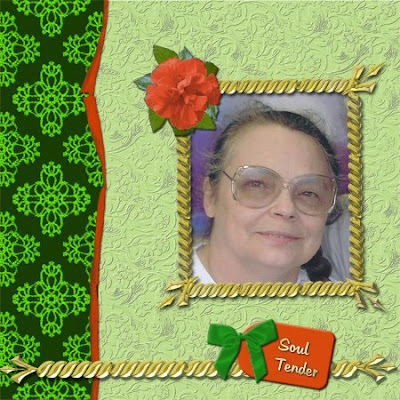 The next new kit will be in honor of my friend Mary Ann. She had surgery yesterday, and I'm waiting to hear that she is alright. 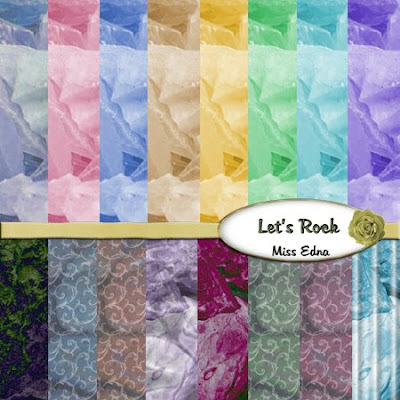 She took some beautiful pictures of rocks while on vacation, and I used some of them to make a kit called "Let's Rock." (Like in "Rock Hound.") I love rocks, and have a few that I have saved for years. Today I got a wonderful package in the mail from Mary Ann, information on how to use a Wacom Tablet. THANK YOU, THANK YOU. I've had the tablet since Christmas, and have never used it because I don't know how. I'm hoping that Andrea Gold at GDS (see link) will soon have a class for this, and I'll be first in line to sign up. http://www.godigitalscrapping.com/. I'm off to play with Tootsie for a while. She's beginning to feel a bit neglected. Here's your freebie. Has anyone noticed? Today is 08-08-08 !!! This will never happen again in most of our lifetimes. In honor of that foolish fact, I played those numbers today. As a rule, I don't gamble, but this is "one-timer" thing. We're smack dab in the middle of Monsoon Season. Three quarters of the day is absolutely delightful. The rest of the day is cool and wet, sometimes very wet, windy and electrical. I can live with this sort of schedule. It's better than hot, hotter, muggy and sticky. 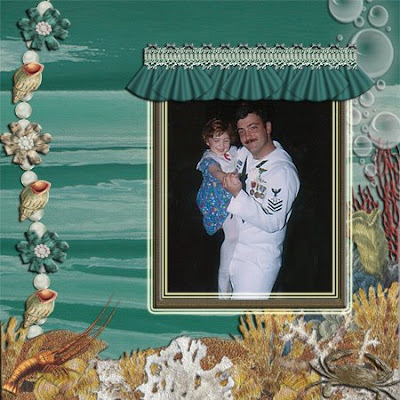 Today, I'm going to share my latest Scraphead challenge layout. What's it about? YUP!! The rain. We're supposed to be scrapping a photo of the weather. Rain is not easy to photograph, but I got a few fairly good shots. I'm also going to post Part Four of "Blooms Galore." It's the rest of the elements. If I have some extra time, I'll try to make up some QP's to match. Tootsie and I are going to play a little ball, and then watch "Law & Order." 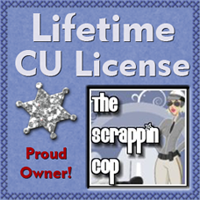 We love the crime and forensic science shows. 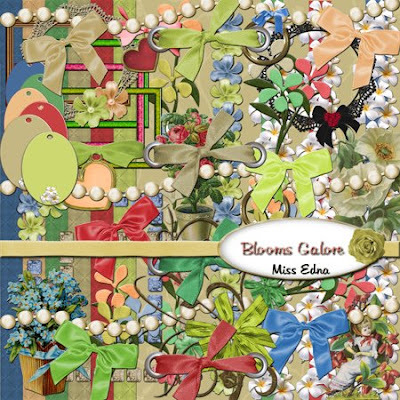 Here is your download link for Part Four of "Blooms Galore"
Wow, what a surprise. 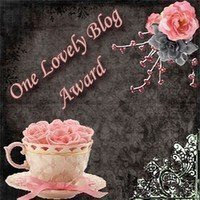 I won another award, the "I Love Your Blog" award. 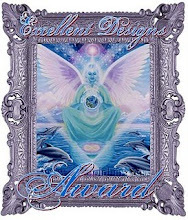 This was presented to my by Anna at http://deliciousscraps.blogspot.com/. Thank you, Anna. This really makes my day. 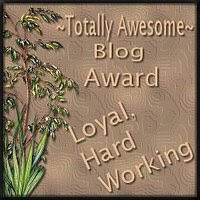 I am thrilled to bits that so many people really do like my blog. It was started because of my scrapping, but then it became a stabilizer for me. It relaxed me, took my mind off my problems, and gave me something new to look forward to every day. 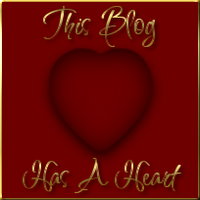 I just lost my hubby this past winter, so my little blog has been a Godsend for me. I absolutely love meeting all the wonderful folks who come through here and stop to say hello. It never ceases to amaze me that I'm meeting nice folks from all over the world without ever leaving my desk. God's been good to me. Thank you. 5. 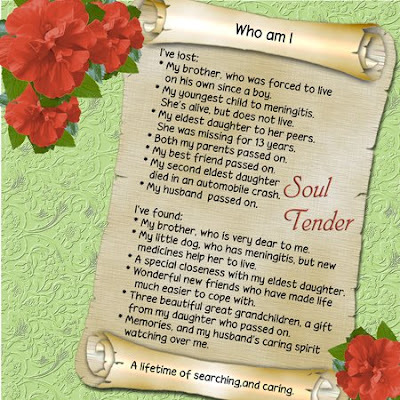 Leave a message on the blogs of the people you have named. 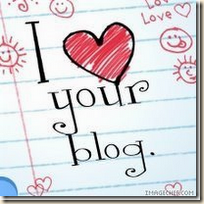 I also have to tag 7 other people, so I checked on all the blogs that I visit every day. 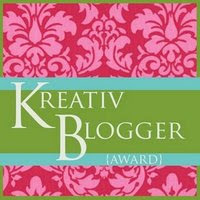 The first seven I visited already had been nominated for the "I Love Your Blog" award and had been tagged. These are two very talented and wonderfully generous ladies. Now that I've listed my names, I'm wanting to go play with Photoshop. 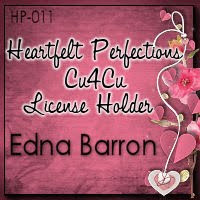 I just got CS3, and I can't wait to play with it. Not that I know what I'm doing, of course, but I'll have loads of fun trying. 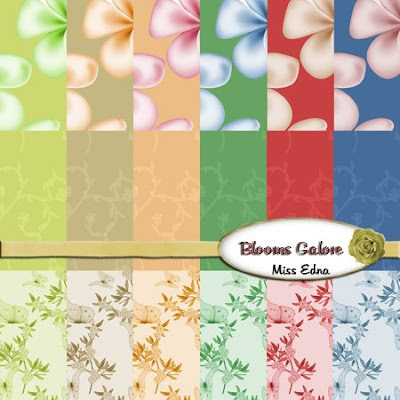 Here is your download link for Part One of the Elements for "Blooms Galore"
I've Been Tagged -- Twice!! Tonight we're playing "try and try again" with Blogger. first we can't post, then we can. I'm not sure if I can upload yet, but I'll try. If they don't let me upload, I'll post two links tomorrow. Fair? What a gorgeous day we had today. Even though it rained on and off, it was cool - just delightful. I'm getting more of a selection of birds at my feeder lately. Even with the rain, we had finches, sparrows, morning doves, cardinals, and even a pair of woodpeckers. Cher, I was sorry to hear of your stay at the hospital. It must feel super good to be home in comfortable surroundings. Take care and rest a lot, and get well soon. 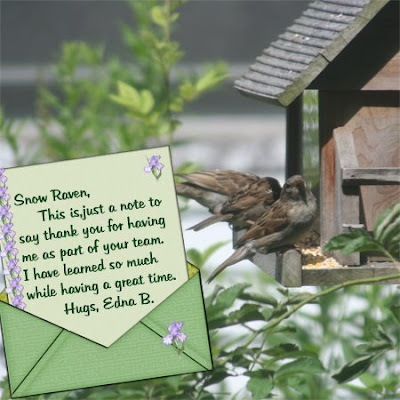 and Snow Raven at http://silversnowyraven.blogspot.com/. 4. Let them know they've tagged by leaving a comment on their blog. Little known facts about Moi. Believe it or not, I used to be tiny and rather scrawny, now there's enough here for quite a few of us. Plump is beautiful! During the Gulf War and Desert Storm, I used to sing and record my songs on tapes that I sent all over to men and women in the service. I wasn't great, but I was a voice from home. I absolutely hate BUGS! Can't stand the little critters. Except ladybugs. They're okay. I used to be so neat and organized. Don't know what happened, but now I'm messy and not very organized at all. I have no patience. I want it all and I want it now. (Is it age? I was very patient before my fifties. Now I'm terrible.) I love all the new "teckie toys." (Things to do with the pc, etc.) I never hit my dog. A few days ago, I fwapped her on the nose. (Not very hard) She insisted on leaving unwanted gifts for me on the carpet. I insisted she should not do this again. 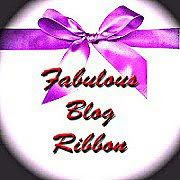 I guess Blogger is fixed, because the upload works again. Well, this morning we went for Tootsie's third chemo treatment, and now just one more later this afternoon (it's a series of four treatments), and we're all set for another four weeks. Come October, we hope to move up to every five weeks. I certainly hope so, Tootsie is just so precious. 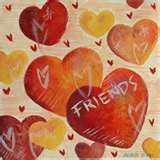 My friend Mary Ann in Wisconsin is going in for shoulder surgery this Friday. I'll be praying for her and hoping all goes well. Today I have to buckle down and get some of the challenges done. I'm a procrastinator. If you can put it off till tomorrow, all the better. That's terrible, isn't it? Also, I took some photos in the rain a couple of days ago, and I need to check them to see how they came out. It's not easy to photograph the rain. Enough already. 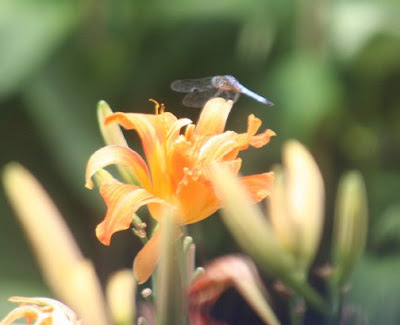 Here's your first part of "Blooms Galore." I hope you like it. Again, you get half of the papers today, and the other half tomorrow. 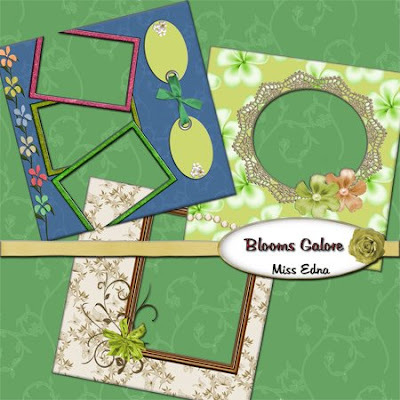 New Kit - "Blooms Galore"
I tried to get in here earlier to start posting a new kit for you, but 4shared wouldn't let me on to store the folders and get links. Had to wait about an hour an a half. I was almost tempted to open an account with Media Fire. We're a bit un-sharp tonight. Worked all night, and then had to take Tootsie in this morning and this afternoon for her chemo treatments. So we're going to turn in a bit early tonight. Hopefully, there will be something good on TV to watch. The new kit is finished, packaged and tucked away in a folder for you to download. I've named it "Blooms Galore." It's kind of big, so I've had to break it into four parts. Tonight, you get Part One, which is half of the papers. Hope you like it. O-O-O-PS!! Sorry, this is not a good night. Now Blogger won't let me upload. I think I will just call it a night, and start over again tomorrow. I'm really sorry. Thanks for understanding. Be back tomorrow. Haven't Heard From Texas - Are You Okay? Last night's storm didn't last too long. Just enough rain to top off the rain barrel. To those of you in Texas, how are you all making out after the nasty storms you've recently had? I'm hoping that no one suffered any serious damages. The weather is crazy lately. We're getting weather and storms that we didn't used to get as a norm. Now we sort of expect anything. Wonder if it has anything to do with the ozone layer? This will be short. We're in the beginning of another electrical storm. The thunder is crashing, and I just saw a couple of bright lights flash. Poor Tootsie had to go to the hospital again this evening. She has a growth or something that looks just like a burrowing tick. The doctor confirmed that it was not a tick, but some sort of growth. Monday, when she goes for her chemo, they will check it more thoroughly. We got home way past dinner time, so I have to go put together something for Tootsie and me. It's been a long night and day, and I'm sort of dragging. You know, I remember when my days began at 5 a.m. and ended at 3 a.m. the next morning, and I never had a "dragging my tushie around" problem. When my kids were growing up, I worked as many jobs as it took to feed and clothe them and put plenty of milk on the table. Even that did not have me dragging. Lord, it must be that thing called "youth." Youth really is beautiful. Not to mention, full of energy. Now I have to buy that teeny weeny little bottle of "Extra Energy" for $6.00 a bottle. It's really only a couple of sips, and I'm not all that sure it works!! 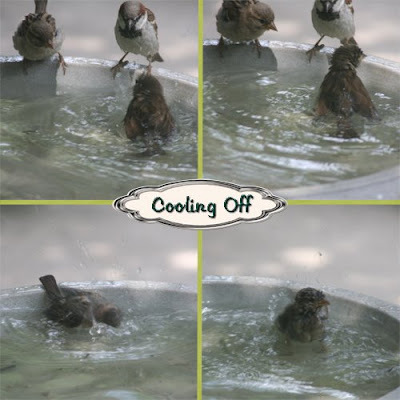 This week has been very warm, and even the little birds are doing whatever they can to cool off. I was able to get a few cute pictures of one little bird in particular, trying to coax his friends into the pool. (bird bath) Have a look. Aren't they just the cutest! !